Justin Moore is an active trombone player and teacher in the Philadelphia area. He previously held the position of Second Trombone with the Acadiana Symphony Orchestra in Lafayette, Louisiana, and has performed with the Pennsylvania Ballet Orchestra, Opera Philadelphia, Ocean City Pops, Symphony in C, Pennsylvania Philharmonic, Black Pearl Chamber Orchestra, Baton Rouge Symphony Orchestra, Louisiana Sinfonietta, Curtis Symphony Orchestra, Atlantic Brass Band, and more. 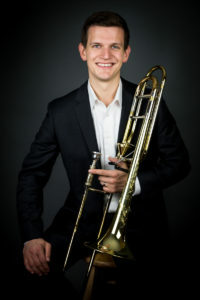 Currently, Justin is the trombone player for the Philadelphia Chamber Brass, EBE Events & Entertainment’s London Bridge, and can be found performing as a soloist or with various orchestras and chamber ensembles throughout Philadelphia. He is on the faculties of the University of Delaware, Immaculata University, Temple University’s Music Preparatory program, the Nelly Berman School of Music, the Conservatory of Musical Arts, and is a visiting instructor at Swarthmore College and Haverford College. He has shared the stage with many notable performers, including the Canadian Brass, Il Volo, Chris Botti, Deana Martin, Allen Vizzutti, Jens Lindemann, Olga Kern, Sonny Landreth, the Philadelphia Orchestra Trombone Section, and Joan Rivers, and has been a part of featured performances at the Great American Brass Band Festival, the American Trombone Workshop, and the International Trumpet Guild Conference. Justin received a Bachelor of Music degree from Louisiana State University and a Master of Music degree from Temple University. His primary teachers include Matt Vaughn, Dr. Jeannie Little, and Dr. Milt Stevens. For more information, visit www.justinmoore.net.